4imprint is the leading direct marketer of promotional products in the US, Canada, the UK and Ireland. 97% of 2017 revenues were generated in the US and Canada. 4imprint’s year-end update indicates another very strong performance, with FY18 revenues ahead 18% – all organic. PBT will be at the top end of the market range with net cash $2.5m ahead of our modelled number at $27.5m. Our forecasts will be formally reviewed with the prelims in March, but we note that management’s revenue goal of $1bn by FY22 now requires a CAGR of 7.9% over the intervening period, well below historical levels. The brand awareness programme implemented in FY18 has clearly helped stimulate growth and the group is accelerating investment in support. The organic growth record, high cash conversion and cash-rich balance sheet all support the current rating, with further upside potential. Note: *PBT and EPS are normalised, excluding amortisation of acquired intangibles and exceptional items. The group’s brand awareness initiative added to the marketing mix last year is paying back more than anticipated, helping propel H218 on H217 organic revenue growth of 18.7%, up from 16.5% in H1, and giving 17.7% for the year. This is well in excess of market growth, estimated by management at around 5%. Given the size of the addressable market – probably two-thirds of the total estimated $23bn US promotional products market – there is plenty of scope for years of continuing premium growth without approaching market share hurdles. FY18 PBT is indicated at least at the top end of the market range, which we take to be around $45.5m on our basis (the company now uses the number post share-based payments, running at around $0.5m). Given the better than expected year-end update, any revisions to our FY19 and FY20 estimates on publication of the FY18 prelims are likely to be on the upside. Given the progress, 4imprint is now pushing the button on further expansion of its distribution centre, which includes its embroidery facility. The indicated spend of $5m is on top of our estimated maintenance capex of $3.3m, but this should be considered in the context of a balance sheet with $27.5m (as yet unaudited) of net cash at the year end. The previous expansion exercise in FY15 was done with minimal operational disruption and was designed to cater for five years’ growth – targets that have been met ahead of schedule. While the group trades at a premium to quoted UK marketing services groups, we argue that there is little in common operationally. 4imprint’s long, positive trading record, cash conversion and progressive dividend also single it out. A DCF on our unadjusted numbers indicates further potential upside, suggesting a value of £22.87 based on a WACC of 9% and terminal growth of 3.0%. 4imprint presents a unique investment case. A UK-listed company, with British and US management, run out of the US and with 97% of revenues generated in the US. It is a distributor of promotional products across the spectrum of enterprises in North America, with a large range of product across categories from pens to apparel. It has a very impressive financial record, with revenue growth for the five years from FY13 through the indicated FY18 number at a CAGR of 17.3%, dropping through to a CAGR for adjusted EPS of 19.2%, all organic (FY18 EPS not yet adjusted for the higher than expected indicated PBT figure). Management stated in FY17 that the revenue target for FY22 was $1bn. This implied a CAGR of 9.8% for FY17–22e. Given the indicated revenue for FY18 in the trading update, a lower CAGR of 7.9% would now be required to hit the stated target on the same timescale. 4imprint operates in a large and diverse market. The PPAI, an industry body, estimates the value of the US promotional products distribution market at US$25bn. 4imprint is the largest distributor, yet has market share of less than 3%. The market is reportedly growing at around 5% for FY18 and 4imprint has consistently grown faster than the market, building share through its reputation for quality, reliability and customer service. There are no direct comparators, as the other large players have differentiated business models, described below. The group’s strong progress comes from a fundamental focus on understanding its customers and meeting (and anticipating) their requirements. The marketing effort draws on this knowledge, with the data feedback loop driving what products are presented to which audiences, when and via what channel. The meld of automation and personalisation continues to prove very effective in delivering a growing top line. 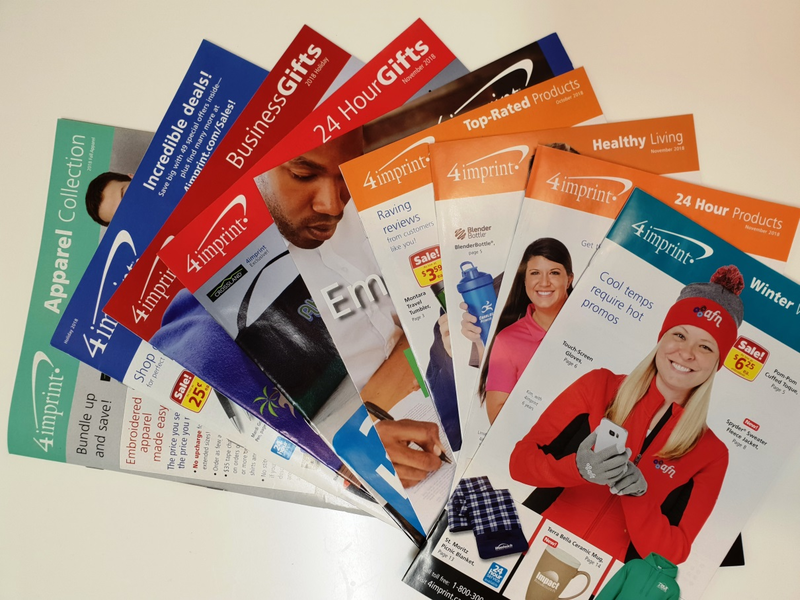 The group employs a range of marketing techniques designed to drive both customer acquisition and customer retention, including sample boxes, print catalogues, email and online search engine optimisation (SEO)/search engine marketing (SEM). It has recently (during FY18) supplemented these with TV and radio advertising to drive brand awareness, which has outperformed management’s expectations in terms of driving new business in its first phase. The business’s cash requirements are modest, as it is primarily a marketing and distribution business, with minimal need to invest in large stock positions or substantial pieces of capital equipment. Historically, significant cash was absorbed by a legacy pension scheme funding requirement (mostly in the UK), but this was addressed and no longer presents a meaningful drain on cash. In FY15, 4imprint extended its main distribution centre and expanded its capacity in embroidery, spending US$9.0m, and in FY18 invested in a TV and radio marketing campaign at a cost of US$7.0m. The trading update announces that the group is pushing ahead with a further expansion at the Oshkosh Distribution Centre, requiring spending of $5m in FY19, to allow for efficient future volume growth. We will add this into our modelling when our figures are formally updated. The group generates cash surplus to internal requirements and has a progressive dividend policy. It also paid out a supplementary dividend in FY17, when the cash position had grown beyond a sensible level. 4imprint’s business model is remarkably straightforward. It supplies customised, promotional products to customers across North America (97% of revenues) and the UK and Ireland (3% of revenues). It is protective of its reputation for ‘best-in-class’ customer service and of its partnership approach to dealing with its suppliers. The scale of the operation is large, running at around 1.3m orders a year, but all are individually customised and of great importance to the customer. The market is highly fragmented – there are an estimated 23,000 distributors in North America alone. It is, however, substantial, estimated by industry body PPAI at around $25bn in 2016. 4imprint’s growth has consistently outstripped the market, with a revenue CAGR of 14.0% for the period FY11–20e, compared to an estimated market growth of 4.8%. This is being delivered through its sophisticated direct marketing operation, based on data and covering online and offline approaches to recruit new customers and to drive return visits. Marketing spend is managed with a view to driving the top line while broadly maintaining operating margin. 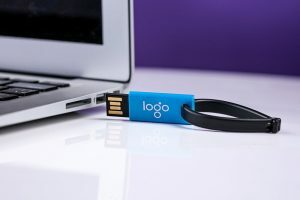 Promotional products are used by businesses to increase the profile of their services, products or events, and also to motivate staff within their own operations. The product range offered by 4imprint is extensive, from the basic, such as pens, bags and drinkware, through to higher priced items such as apparel, business gifts and full displays for trade shows. All are customised with the name and/or logo of the organisation doing the promotion. 4imprint has over 5,000 products that can be customised and shipped in less than 24 hours (order today, ship tomorrow) and over 600 exclusive lines. Overall, the group lists around 50,000 SKUs, taking into account different colourways, etc. The average order quantity is over 300 items. The immediacy of the relationships with both customers and suppliers allow for trends to be quickly identified and addressed. 4imprint only carries a small amount of inventory, principally the own-branded Crossland apparel. The general method of working is on a ‘drop-ship’ basis, whereby the supplier holds the inventory, prints the product and ships it directly to the customer. This gives 4imprint the ability to offer a far higher number of product lines, without any of the associated stock risk. It does require a high degree of trust and co-operation between the group and its supplier base, which it cements through a collaborative/partnership-based approach and prompt payment. At the end of December 2017, 4imprint was holding $5.4m of finished goods and goods for resale, compared with FY17 revenues of $627.5m. At the half-year, this had risen to $9.6m, but this reflects a shift in revenue recognition to the point of customer receipt rather than at despatch, so now includes the value of goods in transit. While it is easy to envisage a high degree of automation with an online business model, part of the strength of the business is the management of the combination of digital and analogue. This applies both to the marketing and the operational side, where day-to-day activities involve a far higher element of hand-holding for customers for whom this type of buying is not central to their normal working practices. Much of the main office in Wisconsin (pictured below) is therefore given over to customer service personnel on the phone to customers and guiding them through the process. Additional staff members are employed at the Distribution Centre, preparing the sample boxes, collating and preparing items for direct shipment from stock and in the custom embroidery function. 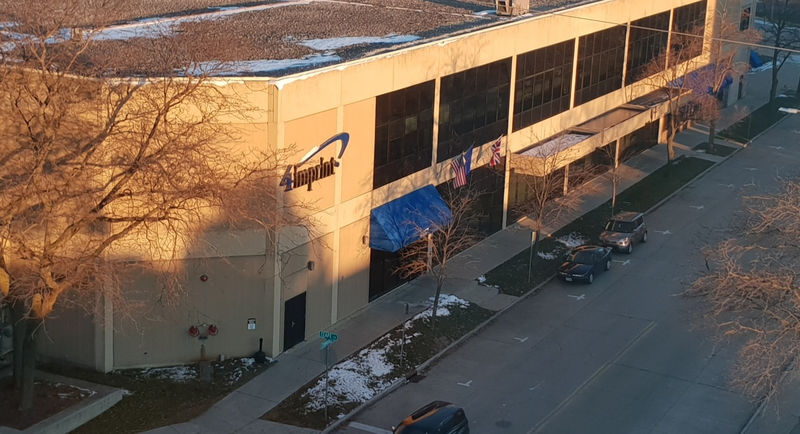 Having been based in Oshkosh since the early 1990s, 4imprint is a well-established local employer and cultivates its reputation as a preferred employer through offering benefits such as training, onsite medical and dental provision (company-funded), holiday pay and pensions. Staff retention is very good, in low single-digits. The personal approach is a crucial element of the differentiation over an order from an online platform, such as Amazon. A team member taking an inbound call has access to that customer’s order history and digital artwork and can walk the customer through the options and process, or talk through those with an inbound enquiry from a new potential customer, building the level of trust needed to drive longer-term, repeat business. Orders are processed, customised, then despatched, mostly direct from the supplier. The large distribution facility is located in an industrial zone on the outskirts of Oshkosh. An idea of the scale is shown in the video above. The distribution centre has three key roles: ‘Blue Box’ marketing, sample pick & pack and embroidery to customise apparel and bags etc. 4imprint is well-known for these Blue Boxes, which are a core element of the marketing, designed to drive customer retention. The contents of the boxes are tailored according to the relevant data, with catalogues and relevant samples enclosed. Embroidery has a particularly high perceived value and is often used as an element of staff motivation, in addition to the promotional benefit. It obviously sells through at higher price points and boosts basket size. The embroidery side of the client offering differs due to the degree of customisation that has to be carried out before despatch. 4imprint has evaluated the business and commercial dynamics of in-housing as opposed to external sourcing. The key issues swaying the argument to an internal solution principally surround scalability, product quality and speed. Unless these can all align, the risk to client satisfaction – and hence quality, repeat business – is too high. Bespoke digital printing is also carried out at the facility for display materials and where transfer printing is preferred or technically superior to embroidery for fabrics and bags. In 2015, management expanded the Oshkosh facility to increase embroidery capacity (as well as enlarging the throughput capacity of the building and enhancing customer service), spending $9m in an expansion programme designed to meet the business’s requirements on a five-year outlook. This took the building from its original 100,000 ft2 to 215,000 ft2. The success in growing this aspect of the group in particular means that the next stage of investment has now been accelerated, albeit at a scale – and cost – of the extension of around half of the previous project, adding another 85,000 ft2 at a budgeted spend of $5.0m. The site is not constrained by close/neighbouring buildings. The UK and Ireland business broadly replicates that in North America, but on a far smaller scale and without the embroidery facility. 4imprint has years of experience honing what does and does not work when it comes to encouraging existing customers to buy and how to recruit new business customers. Management monitors marketing effectiveness through KPIs such as customers acquired and the percentage retained after 12 and 24 months. Customer acquisition has historically been more heavily weighted to Q2 and Q3 on an increasing trend across the last decade, with between 31% and 36% ordering again within the subsequent 12 months and between 40% and 45% re-ordering before two years have passed. The data derived from each marketing exercise is fed back into the planning and this element is a vital part of the group’s IP and a significant element in how it has been able to build its market share through understanding its customers’ needs and buying patterns. The marketing suite is broad, taking in ‘traditional’ catalogues. SEM (search engine marketing), email, quantitative analytics, the Blue Box samples (used for customer retention) and, more recently, television and radio campaigns aimed at boosting brand awareness. The management of the marketing mix is sophisticated. While catalogues may look to be a 20th century technique, they are proven and still very effective in a B2B context and suit the nature of the businesses that form the core customer constituency, likely sitting on the desk of the targeted individual. The photographic work is done in house in studios at the head office, with models all being from the workforce. Having a range of smaller catalogues allows them to be configured in line with the output of ongoing data analysis to best drive the top line. 4imprint is and remains a data-driven direct marketing business. It somewhat surprised the market in early FY18 by adding linear TV to the marketing mix, in a move designed to promote the group’s brand awareness rather than to directly drive sales. There were some small-scale experiments with radio advertising in H217 and, as is usual for 4imprint, the outcomes were closely scrutinised to inform the planning process. While it may seem counterintuitive to use traditional media channels, the $7m investment programme was incremental to the existing spend patterns and designed to help to leverage that spend through extending the brand reach within the target customer profile, rather than broadening into new demographics. The overall group marketing spend is around $120m. The brand awareness campaign has delivered ahead of prior expectations, delivering a greater proportion of direct traffic to the website, as opposed to traffic delivered via search/Google, and in inbound interest over the phone. Unprompted brand awareness is expected to have risen by a greater extent than originally anticipated. The concept, creative and messaging have all been validated and refined, with the next phase assessing how best to scale the campaign while maintaining efficacy. The potential is obviously difficult to quantify, but could be of the order of 10–15%. Although final conclusions have not yet been formally expressed, it seems to us likely that the promotion of the brand will form a proportion of the continuing marketing budget. The customer landscape is looked at in the section below, but it is easy to overlook the importance of the supplier relationships in the business model. 4imprint guards its corporate integrity closely and this extends to its supply chain. Ethical standards on employment and sourcing back through the chain are high and the potential reputational impact of any lowering or breach of these standards on either 4imprint or its clients is considerable. Just as there is ongoing consolidation within the distributors, there is a mirroring process happening within the supply base, with the bigger suppliers getting bigger and private equity funding moving into the sector. As 4imprint’s business has scaled up, it has had to manage these supplier relationships in order to continue to meet customer expectations on quality and the expedited delivery schedules. This has necessitated gravitating to suppliers also of greater scale, where key factors, such as regulatory requirements, product safety and documented provenance, are easier to manage. The group’s general approach is that of partnership. Given its industry positioning as market leader, it will tend to be the supplier’s largest customer, but it also endeavours to be a favoured customer through good communication and prompt payment. There is a natural limit on supplier concentration, given the sheer number of SKUs being offered across the various catalogues and online. Management estimates that the 10 largest suppliers account for around half of the overall group volume. Roughly one-third (and growing) of the total supplier base is supplying multiple product lines, a further third are supplying apparel and the balance have a particular product speciality. There is a core team of senior merchandisers negotiating the larger contracts and conducting social/compliance audits, with around 25 further team members in support. Goods are designed and produced overseas and shipped to the US for decoration or else sourced domestically. For apparel, it was the growing scale of the operation that drove the decision to in-house the embroidery process. Supplier prices are normally published and set on an annual basis. The latest US government statistics show that there were just below 6m enterprises employing 500 or fewer staff in 2016, of which the overwhelming majority employ fewer than 20. There were 629k enterprises that employed between 20 and 500 workers. 4imprint identifies its target customer base as those employing more than 10 people and generating over $1m in revenue, so this measure is a reasonable proxy. The split by business sector is shown below. The size of the US promotional products market is estimated at $23bn by the PPAI ($25bn including Canada). Management estimates that around one-third of the total market is accounted for by corporate programmes, ie contractual relationships with large corporations. Given the overall scale of the promotional products sector, 4imprint is able to afford to sidestep this corporate programme segment of the market, which would be significantly more capital intensive and contractual in nature. This leaves around two-thirds of the market truly addressable, allowing for considerable further growth before any market share constraints might emerge. The PPAI statistics show apparel is the largest category of promotional products, at 28.8% of industry sales (increasing to 35.8% if accessories are included), followed by drinkware at 8.4%, writing at 6.6% and bags at 6.3%. 4imprint’s largest categories are shown above in Exhibit 1 and follow a broadly similar pattern. However, apparel is a more recent addition to the mix, building over the last five years, and we assume that it is still relatively underweight. This is a competitive landscape, but the participants are predominantly small and locally active. Over the last few years, 4imprint’s growth has moved it up the relative ‘league table’ and it now has the largest sales of all US promotional product distributors. However, it still accounts for below 3% of the estimated market. The second placed firm is Staples Promotional Products, based on the PPAI estimates (Staples is privately owned). The difficulty in measuring here is that promotional goods are sold alongside other office products. Unlike 4imprint, Staples is particularly heavily weighted to corporate programmes. Its FY17 revenues were estimated at $593m, versus 4imprint at $608m. Halo Branded Solutions is also among the larger players (FY17 sales of $416m) and has also been expanding, but has a markedly different business model, being based on regional field salesforces travelling around the client pool. It has been adding smaller groups, often putting product categories in front of clients that those clients might not otherwise have considered. Proforma (FY17 sales: $369m) has a franchise-based business model based on printing, design and brand promotion, while BDA (FY sales: $347m) has a strong franchise in licensed sports affiliated merchandise. Altitude Group is not considered a direct competitor as it is a SaaS and platform business within the sector, as opposed to a distributor. Amazon has more recently been cited as a potential threat to the business model. While Amazon is underestimated at any competitor’s peril, we do not believe that a significant proportion of this type of trade will be transferring. As explained above, 4imprint’s operation involves a meaningful amount of interaction with the client to make sure that the design and specification are as required. For distributors selling through the Amazon Marketplace, the commission charged can vary from 15–25% of the sale price. As volumes are modest, due to the personalisation, this proposition is not likely to be that attractive to the core supplier base. CEO Kevin Lyons-Tarr has been with the business since 1991 and is based in Oshkosh, Wisconsin. He has performed a number of roles within the group, including being CIO and COO, and become president of the Direct Marketing business in 2004. He was appointed as an executive director in 2012 and then CEO in March 2015. David Seekings, the group CFO (KPMG-trained), is also a long-standing employee, having joined as group financial controller in 1996. He moved from the UK to Oshkosh in 2000 to take up the role of CFO of 4imprint Direct Marketing and was appointed overall group CFO in March 2015, remaining in the US. They are both based (physically) at the centre of the principal office in Oshkosh from where the direct marketing is carried out. Economic. 4imprint deals with corporate customers across North America. Its particular sweet spot is small and medium-sized commercial enterprises (with between 20 and 500 employees) that make up 31% of the US workforce (source: SUSB). These are the firms that are large enough to be considering marketing their organisations, but not so large as to have the capacity to source directly. As such, the economic cyclicality is limited. There are also some counter-cyclical elements, with businesses perhaps more likely to drive differentiation and bolster their market positioning, but any prolonged or deeper economic weakness would undoubtedly have a deleterious impact. Marketing efficacy. 4imprint has a strong record of translating its marketing spending into revenue growth through the application of data analysis to its various promotional advertising and marketing drivers. The range of options it uses – and its openness to try new approaches – should enable it to continue to focus its spend on the most effective methods. Currency. Although the group earns 97% of its revenues in US dollars, it carries its head office costs, pension scheme commitments and pays its dividend in sterling. It reports in US dollars, so a stronger dollar has a positive impact. Competitive risks. As outlined in the section above on the promotional goods landscape, there are both large national and localised and regional competitors. However, there are no other direct marketers in these product categories anywhere near the scale of 4imprint. With a focus on quality and service, the competitive risk from predatory pricing is relatively limited. The close and direct relationships to both customers and suppliers should enable the group to continue to have a good sense of market dynamics. Supplier consolidation/concentration/reputational risks. 4imprint has been going through a process over recent years in migrating its supplier base upscale, with more coherent disciplines on sourcing, which should mitigate the reputational risks, although it would never be possible to eliminate these entirely. Data security. While the US market is not subject to the GDPR, the reputational risks through any mishandling of data could be considerable and would undermine the relationship of trust that the group has built both with customers and suppliers. Single site distribution. The bulk of 4imprint’s sales volume is shipped directly from the suppliers. For its own products and for the apparel/embroidery, the group operates from its large distribution centre on the edge of Oshkosh. Dependence on postal and courier services. Rising postal costs have sometimes been an issue (USPS prices rose 37% over 2012–17) but are an unavoidable cost of business, borne by the client. Tariffs. The vacillation over the imposition of tariffs has been a complication of the business model under the Trump administration. The initial imposition at 10% was largely absorbed within the supply chain. The threatened raising to 25% in January 2019 has been put on hold by the government, but has required extensive planning, particularly as the categories of goods subject to tariffs is not necessarily logical or consistent. Up to one-third of products were potentially affected, particularly in bags/totes and caps. Work was done on pricing and on supply to mitigate the impact so far as sensible, with the further assumption that suppliers would be using existing inventory first. Possibly a greater impact would be felt if the imposition of tariffs had a throttling effect on the overall economy. For a long period, the group’s historical pension arrangements were material to the financial outcome. With the work done over previous periods to move the scheme’s liabilities off the balance sheet, this no longer represents a particular sensitivity to the financial model. 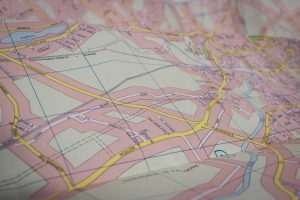 For a company operating on a ‘mature’ basis, we would normally assess the valuation relative to other quoted businesses with similar operating models. We would then sense check this valuation via a discounted cash flow analysis. The issue for 4imprint is that there are not any genuine peers to measure it against. For context, therefore, we have looked at the multiples of other smaller/medium marketing services companies and at those of a smaller group of US B2B distributors, albeit that they operate in different market segments with greatly differing dynamics. The UK small- and mid-cap marketing services groups self-evidently have business models substantially different from 4imprint and none have anything like the consistent performance record. They are nevertheless listed in the same sector and provide a particular backdrop. 4imprint is trading at a premium to these companies, which is to be expected given the financial record, strong balance sheet, high levels of cash conversion and potential for further growth. The lower EBITDA margin for 4imprint is simply a reflection of its different business model, with those peers shown in the table being primarily ‘people’ businesses. Source: I/B/E/S, Edison Investment Research. Note: *Excluded from average. Prices as at 16 January 2019. Again, we provide this comparison with more than a degree of caution, given the disparity in the nature of their operations. The three we have picked out have some relevancy: Veritiv as it supplies B2B print, publishing and packaging services; Essendant, which is in the B2B supply and distribution of workplace products; and Core-Mark Holdings, which distributes and markets consumer goods. Source: I/B/E/S, Edison Investment Research. Note: Prices as at 16 January 2019. The P/E multiples here are unreliable due to the volatility of underlying earnings and we would expect EBITDA to be a better reflection of the progression. Again, 4imprint trades at a premium on EV/EBITDA, albeit more modest and at least in part reflecting the higher levels of margin. Given the issues with the peer-based approach and given the group’s financial characteristics – in particular the element of repeat business, the $1bn revenue target for FY22 and the management towards a maintained operating margin – the use of a DCF is more justifiable than is often the case. We often look at a reverse DCF technique, where we vary the medium-term growth rate and the EBITDA margin, but in this instance there is designed to be little variation to the latter, which inclines us to using a more traditional approach. In Exhibit 10, below, we show a range of terminal growth rates and WACCs. Using a WACC of 9% and a terminal growth rate of 3%, the DCF indicates a valuation of £22.87, 14% above the current share price. We used a WACC of 9.5% in our November note, with the same terminal growth rate, generating a valuation of £21.20. However, it is worth noting that this DCF is based on forecasts unadjusted for the better-than-expected trading update. As indicated above, the trading update gives FY18 revenues at $738.4m, 2% ahead of our forecast of $725.0m. The guidance of PBT to “at least the upper end of the range of current market forecasts” suggests an outcome of a minimum of $45.5m, or $45.0m on a post share-based payments basis. This is around 1% higher than we had projected, continuing an established record of positive trading announcements. The indicated net cash figure of $27.5m is also ahead of our modelled $25.0m, but this could be due to timing elements in working capital or taxation payments. We will formally update our model on the publication of the full FY18 results, scheduled for 5 March. 4imprint now has a long record of consistent top-line growth, which is set to continue over the forecast period. Moreover, this is organic growth through a growing market and through gains in market share, rather than as the result of any acquisition programme. With no realistic candidates in the market, our forecast assumptions are also for straightforward organic growth in the same mould. Management has publicly set the target of reaching revenue of $1bn by FY22. Achieving this will require a top-line CAGR of 9.8% for FY17–22e. If the FY18 revenue figure is in line with our estimate, the CAGR for FY18–22e comes in to 8.4%, which looks eminently achievable in the context of the growth record as shown above. The group’s gross profit margin varies little, staying in a tight range of 32–35% over the last 10 years and steadying at 33% for the last five. We have modelled it continuing at this rate, although there may be slight variations according to mix. Below that line there is an element of comparatively fixed cost, covering off administration, central/listing costs (4.3% of FY17 revenue, 4.1% of FY16) and selling costs (4% of FY17 revenue, 4.6% of FY16). The key variable element of the income statement is the marketing cost. Historically the business has been run managing that marketing spend in order to grow the top line while maintaining the operating margin. FY18 has seen a modest step away from that model in order to fund the brand marketing campaign on TV and radio, designed to boost awareness of the 4imprint brand. This has used a supplementary $7m on top of the ‘normal’ marketing spend of around $120m (17.6% of revenue was spent in FY17, 17.3% in FY16). We would expect management to say more about its plans for FY19 and future marketing priorities with the full FY18 results in March. We have shown the EBITDA margin in Exhibit 12, above, which shows it in the 6.7–7.2% range from FY11–17, dipping to 6.6% in our modelled FY18 figures, then reverting to 6.9%. The CAGR in group EPS is impressive, running at 19% for FY13–18e. Our forecast earnings growth for FY17–20e is 13.5%. 4imprint has proactively addressed its historical pension issues over the period since FY12, making larger contributions in FY12, FY14 and FY16. Obligations peaked in the balance sheet in FY12 at just short of $37m. The payments have now settled at the $3.6–3.7m per annum level, with defined benefit administration charges of $0.3m pa and an annual net pension finance charge of around $0.5m. From FY18, the group is benefiting from the reductions in US corporation tax, with the expected rate now 20–21%, from recent periods in the high 20s%. The tariff situation in the US is currently that a 10% tariff on certain categories of imported goods is levied. This was introduced in September 2018 and has largely been absorbed along the supply chain. The Trump administration’s intention was to lift the rate to 25% from 1 January 2019. This has now been shifted out to 2 March 2019 while trade talks between the US and China are ongoing. 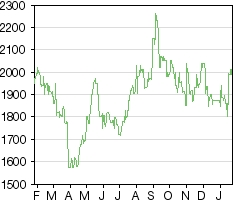 Management does not anticipate any significant short-term impact from the tariff imposition going ahead, as pricing for the year is already agreed and suppliers are working off existing inventory. The work needed to be done in those supplier negotiations and on internal systems is already in place. The partnership approach taken with suppliers should put 4imprint in a good position if any shortages occur. Replacing imports with locally produced items is unlikely to be possible due to volumes and comparative cost. If the trade war were to escalate, then the potential impact on the US economy would be a bigger issue in our projections. 4imprint has high inherent cash conversion, with the cash generated over the period from FY11 through FY17 shown below, along with the uses made of that cash. The conversion of operating profit to free cash flow (pre-tax) over the same period was 103%. The group has no need for substantial infrastructure capex to grow its volumes, since, as explained above, it is not manufacturing product, albeit that there is product enhancement in the embroidery activity. With the growing emphasis on this aspect in response to client demand and with the larger scale of the business, a major expansion programme for the distribution centre was carried through in FY15 at a cost of $9m (brought in on time and on budget). This was done with a view to adding sufficient capacity to meet anticipated growth for a five-year period. The strong trading over recent periods has shrunk that timescale and the recent update outlined a further $5.0m spend on expanding the distribution centre, as described above. Working capital requirements will only rise minimally, with very little stock held. Given that there is prevalence for customers to pay on credit cards, with credit-checking an integral part of the customer on-boarding process, there is little exposure to bad or doubtful debts. As mentioned above, the requirement to fund pension contributions is now predictable and manageable, alongside the administration and pension finance charges. The group purchases shares for the EBT in order to meet the requirements of the SAYE scheme and of management share options. The payout in ordinary dividends averages just below 50% over the last five years. A supplementary dividend was paid for FY17 of US$0.60, on top of the regular dividend for the year of $0.581. This was in light of the net cash on the year-end balance sheet reaching over $30m. Organic growth initiatives. These could be capital in nature or supplementary to the P&L through pursuing market share opportunities and developing within existing markets. Regular dividend payments. The policy is progressive, in line with growth in EPS, to be paid out every six months (declared in US dollars but paid in sterling). Residual legacy pension funding. The agreement with the trustees covers a five-year cash commitment (from FY16). The heaviest payments were $26.5m in FY14 and $17.4m in FY16, with the continuing payments modelled at $3.7m for FY18 and $3.6m thereafter. Further de-risking is possible but the scale is obviously now not the same and therefore payments are now entirely predictable and manageable. M&A. This is on the list as it is not completely ruled out. The likelihood of it occurring is reasonably remote considering the lack of suitable candidates of scale in the market. Any opportunities that might come up for consideration would be to support the organic growth in the core businesses rather than diversifying the model. Further shareholder distributions. Similar exercises are possible in future if the cash balance again builds to levels well beyond the requirements for running an efficient business. With debtors and creditors running broadly equal, and little in the way of stock on the balance sheet, the key features are the pension deficit and the cash. The former is now stabilised and reducing at $3.0m per annum. Given the strong cash conversion described above, the cash position on the balance sheet continues to strengthen. Management has set out balance sheet funding guidelines, which specify that the group should run a cash-positive balance sufficient to cover: the cost of the expected core dividend payments for the next year; known pension commitments; and known capital or investment spending requirements. Any significant surplus over these requirements may be available for supplementary distribution to shareholders. Operating Profit (before amort. and except). Kevin joined the business in 1991, acting in various capacities including CIO and COO, before being appointed president of the Direct Marketing business in 2004. He was appointed as an executive director in 2012 and as CEO in March 2015. David is a chartered accountant (KPMG) and joined 4imprint in 1996 as group financial controller. He relocated to the US in 2000 as CFO of the Direct Marketing business and was appointed as group CFO in 2015. Paul joined the Board in February 2016 and was appointed chairman in December the same year. He is also non-executive chairman of Card Factory and a non-exec at Pets at Home. He spent 17 years at Britvic, the last eight as CEO. This report has been commissioned by 4imprint Group and prepared and issued by Edison, in consideration of a fee payable by 4imprint Group. Edison Investment Research standard fees are £49,500 pa for the production and broad dissemination of a detailed note (Outlook) following by regular (typically quarterly) update notes. Fees are paid upfront in cash without recourse. Edison may seek additional fees for the provision of roadshows and related IR services for the client but does not get remunerated for any investment banking services. We never take payment in stock, options or warrants for any of our services.